If you've ever dreamed about visiting the lost island of Atlantis, Villa Artemis may well be a dream come true for you. Villa Artemis is located in the midst of the traditional community of Megalochori, a place proud to maintain its traditions without being overly influenced by the faster pace of modern life. Upon arriving in Megalochori, you'll find narrow streets, marble churches with traditional architectural bells and endless vineyards to take you to another period and time. Villa Artemis sits firmly in the region's traditional 1900s feel despite its renovation in 2013 by architects MPLUSM and civil engineer Tziotis Georgios. 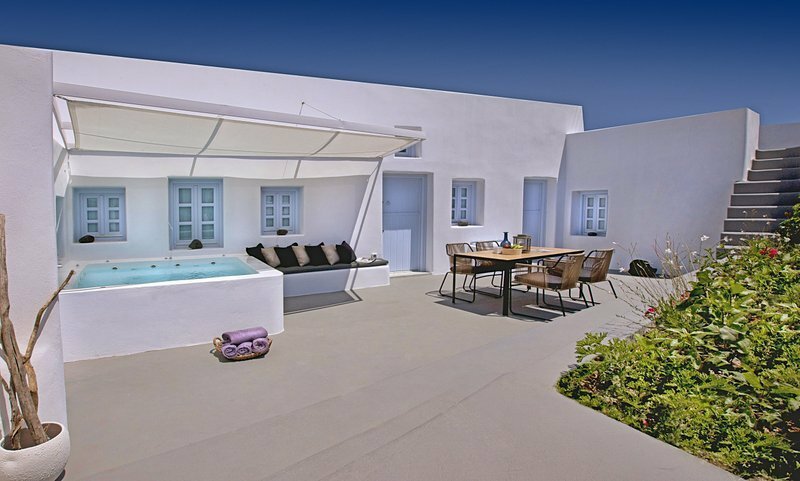 It subtly utilises traditional Thira architecture to a minimal, refining what is already there while added smartness, chic design and a luxurious style. Villa Artemis' hospitality combines the unique beauty of the island with the unforgettable experience of a stay in a truly beautiful luxury holiday home. Villa Artemis is a traditionally renovated building of 120 square metres which can accommodate 2-6 guests with a minimum three-night stay. The villa has two independent bedrooms each with its own private bathroom. The premises is so spacious that two more guests can easily be accommodated on the sofabeds in the living room. There is also an LED/3D SMART TV with satellite access, a DVD Blue Ray as well as free wi-fi and air-conditioning throughout the villa. The kitchen comes with all appliances, and there's a fully furnished garden garden outside. There's even a a heated Jacuzzi and a roof garden with a truly spectacular view! The earth tones used for decoration throughout combined with the luxurious and minimal decoration are sure to offer warmth and familiarity for each and every guest. Rental of private yachts/helicopter so you can explore every inch of the island. Megalochori is a truly picturesque village, thanks in part to the way it had managed to maintain its traditional architecture.Opinions differ on the origin of the name - some say that it came from the agricultural fields that the villagers kept, others argue that the name reflects the personality of the place. Even though most of the houses have been renovated, Megalochori has managed to retain many of its traditional values - including many picturesque local churches and the many vineyards that produce fine local wines. The nearby beaches are superb, and whatever you do, make sure to try some of the traditionally produced sun-dried tomatoes. Megalochori is located very centrally on the Methana Peninsula in Greece, which makes any part of the island easily accessible. The nearby community has an abundance of restaurants, tavernas, cafes, bakers, mini-markets, tourist shops and wineries - are all easy to find and you'll find the locals incredibly welcoming. Megalochori also has complete road access to all destinations around the Methana, so getting around is easy.